Today, I have a proper British pud for you, just in time for Christmas! Last Christmas I brought you Vegan Mincemeat and Vegan Mince Pies and I wanted to carry on the theme with a Vegan Christmas Pudding, or Plum Pudding as it is otherwise known. If you want more than dessert though, go check out my Vegan Christmas Dinner Menu, Shopping List and Timeline. I have planned the whole meal for you, down to the tiniest detail! 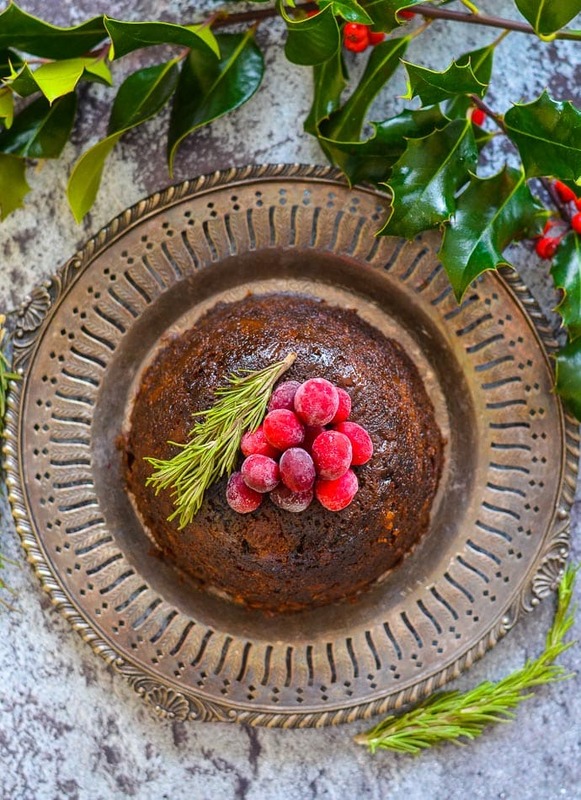 If it’s just dessert you’re after though, then this Vegan Christmas pudding is for you! Christmas Pudding is such a popular dessert at Christmas. I think that most families have one and I certainly grew up with it being served every year. The funny thing is, I absolutely hated it. In fact, I think most children do. I guess it’s a dessert that’s suited to more mature palates. Now though, I can’t get enough. It’s so good! I wonder if part of the reason I didn’t like it was because it was always so heavy and dense. I also have a terrible memory of a time when it was served up with ice cream and all of the animal fat in the pudding turned white and solidified. It was the most awful, congealed thing ever. ???? At the time I wasn’t vegan, and had no interest in reading labels and so had no idea that Christmas Puddings were made with suet. For those of you who don’t know what suet is, it’s a type of animal fat that comes from around the kidneys of sheep and cows. That’s why it hardened and went white when it came into contact with my ice-cream. Pretty disgusting, eh? These days, a lot of Christmas Pudding are actually made with vegetarian suet but despite that, they still use eggs so aren’t typically vegan. You might be wondering why I didn’t use vegetarian suet in this recipe? Firstly it’s not widely available in Canada. Secondly, whilst it’s vegetarian and doesn’t contain any animal products, it does contain palm oil which I try my best to avoid for ethical reasons. Thirdly it’s pretty highly processed. 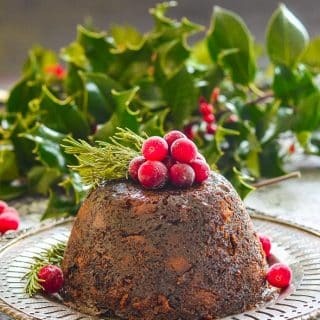 Suet is traditionally used in Christmas Pudding because it has a high melting point and the pudding has a chance to set before the suet melts properly. Apparently, if you were to use a fat source with a lower melting point like butter, the pudding will become heavier and greasier. After testing many variations of my Suet-free Christmas Pudding recipe, I settled on using coconut oil to replace the suet, which is ironic as it has a really low melting point. It does a fantastic job in this recipe though. 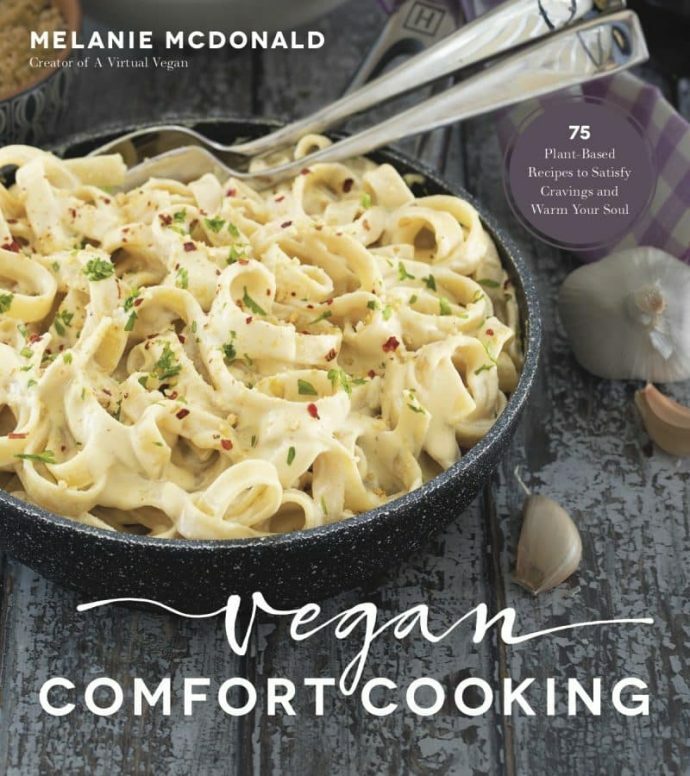 I tried many alternatives including my Vegan Butter, a light olive oil, and oil-free versions with coconut butter or nut butter, but coconut oil came out tops every time. I try to make a lot of my recipes oil-free whenever I can, but there was no getting away from the fact that this recipe needs a bit of oil to be good. And it is Christmas after-all! The coconut oil gives the pudding a beautiful moistness and despite what the suet supporters would have you believe, it isn’t greasy in the slightest. It even stands the cold ice-cream test! 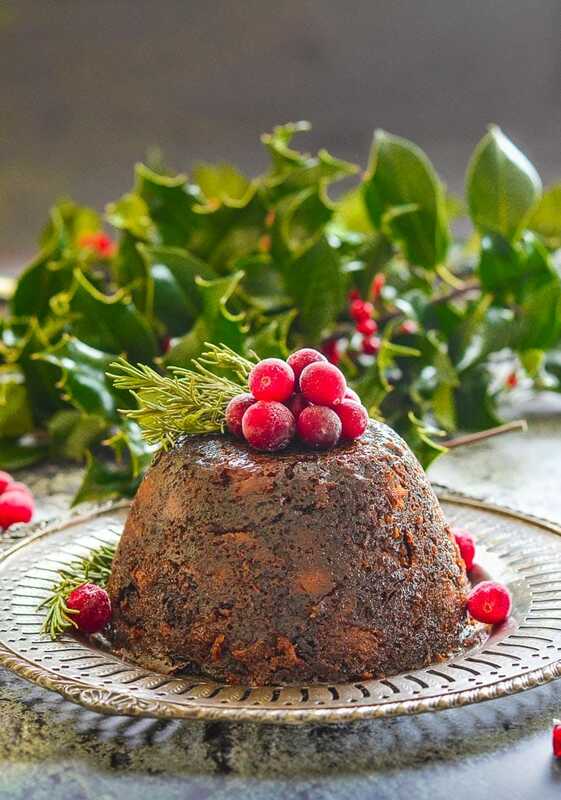 As well as being perfectly moist, this Vegan Christmas Pudding is rich, dark, absolutely packed with flavour and for a pudding that is literally stuffed with dried fruit, it is surprisingly light. Not at all like the heavy, dense puddings of my childhood. I hesitated to call it ‘The Ultimate Vegan Christmas Pudding‘ because it feels a little conceited, but it really is that good. In fact, I think it’s The Ultimate Christmas Pudding period. Vegan or not. It is better than any non-vegan Christmas Pudding I have eaten (and I’ve eaten quite a few ????). 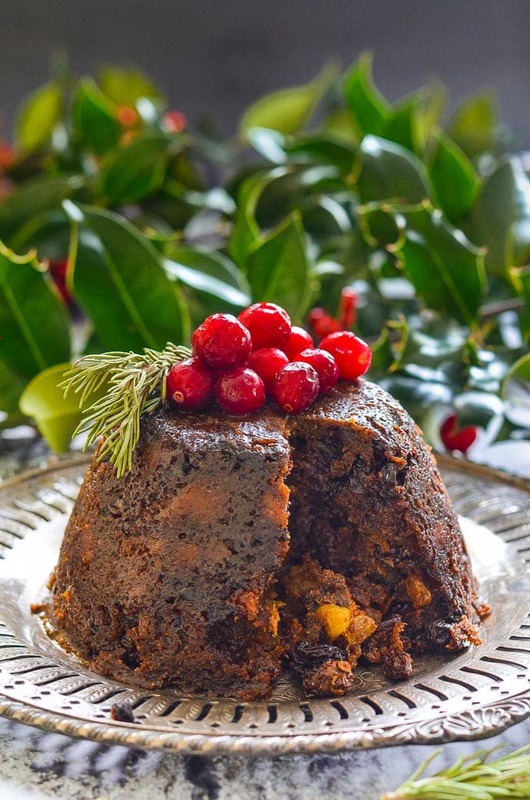 WHY IS CHRISTMAS PUDDING ALSO KNOWN AS PLUM PUDDING? Christmas Pudding dates back to the 15th century where it was made with a combination of meat, root vegetables and dried fruit and known as “plum potage”. The term “plum” was (and still is when describing this pudding), a generic term to describe any dried fruits. Confusingly a Christmas or Plum Pudding doesn’t have to contain plums. Most commonly used then and now are raisins, currants and prunes along with any other dried, preserved or candied fruit that came to hand. As dried fruit became easier to acquire, the pudding gradually transitioned to become a sweet one. Suet (animal fat) however, was and still is commonly used, until I got my hands on it that is! 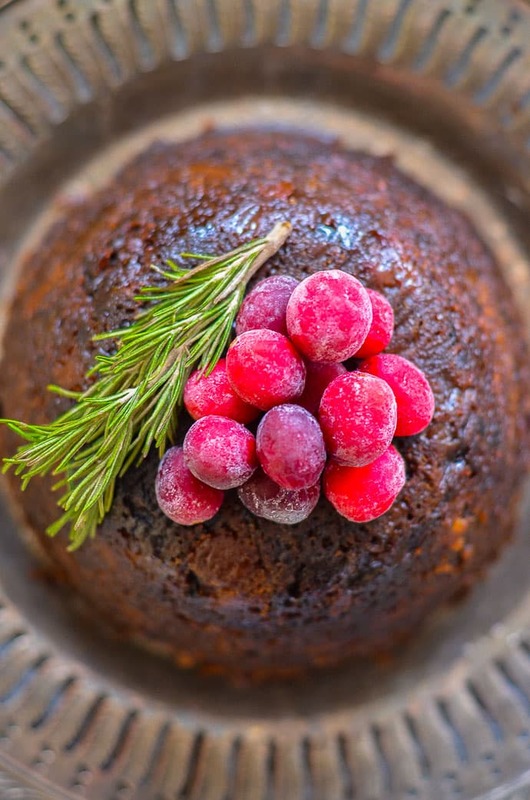 A lot of people feel a little daunted at the thought of making their own Christmas Pudding but it really isn’t difficult at all and the hands on time is pretty minimal. See my step by step video just above the recipe! 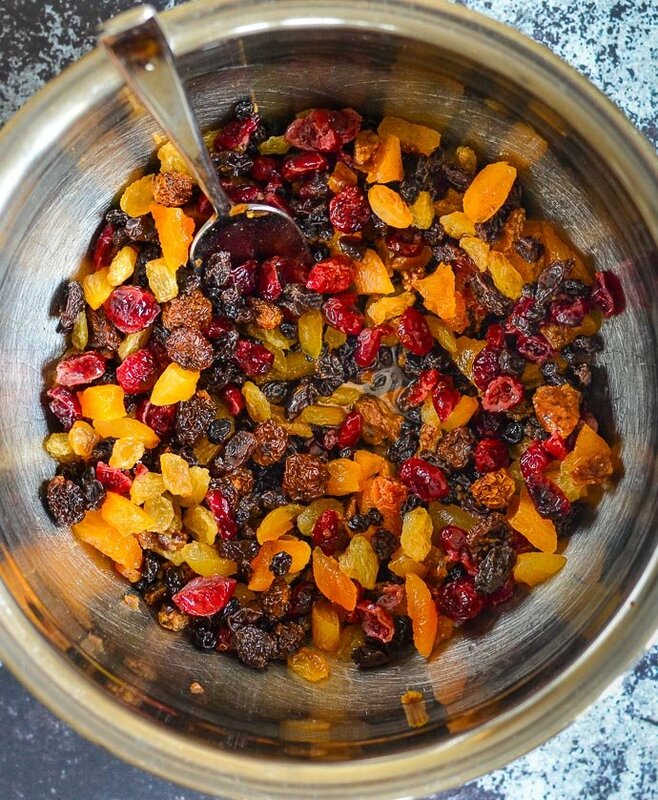 You start by steeping the dried fruit in plenty of booze! You only need to leave it for as long as it takes the fruit to soak it all up. It doesn’t take long and looks so glisteningly pretty! Then it’s just a case of stirring in all of the other ingredients and pouring the batter into a pudding basin that holds about 0.75 – 1 litre (1 quart). If it’s a little bigger it won’t hurt too much, it just won’t completely fill the basin. I use an earthenware Mason Cash pudding basin like the one in the picture below. You can pick up one like it from Amazon or any good kitchen supply store. It’s the same one I have and will probably last forever (unless I drop it!) but you can also buy plastic ones with lids if you want a cheaper option. Either follow my directions for cooking in an Instant Pot (or any other electric pressure cooker) or use a steamer or you can simply boil the pudding in a pan of water. Once the Vegan Christmas Pudding is cooked, remove the wrapping and allow to cool, then wrap again in fresh parchment paper and foil to store. If you go the old fashioned route, the pudding will take 3 hours to steam, but this is all hands off time, except for checking that the water isn’t drying up occasionally. If you have an Instant Pot though it will take about half that time (that includes the natural pressure release and coming to pressure etc). I give full directions for how to cook a Christmas Pudding in an Instant Pot in my instructions below. Traditionally a Christmas Pudding is flamed immediately prior to serving. The hot pudding is doused in steaming hot alcohol and the vapours from the alcohol are set alight so that the whole pudding goes up in flames. It kind of scares me though, but I did attempt to get it to go up in flames for my photos. I tried and tried with no success, until my pudding was like a brandy soaked sponge and my brandy bottle was empty ????. Eventually I gave up, stuck a pile of cranberries and a sprig of rosemary on top, and called it a day! My un-singed eyebrows thank me. If you decide to set yours alight, please do so carefully! DO I NEED TO MAKE CHRISTMAS PUDDING IN ADVANCE? This Vegan Christmas Pudding is excellent eaten right away. There is no need to make it weeks or months in advance. However, it will get even better with age and you can make it up to 12 weeks in advance then store it wrapped in a cool, dark place if you want to. It would probably last way longer than that but I have only tested this recipe for 12 weeks. To make it EVEN better, whilst in storage, feed it a tablespoon of alcohol every week. It will guzzle it up like a thirsty beasty and become even moister and boozier! This Vegan Christmas Pudding freezes well and will keep, if wrapped properly, for up to one year. Just thaw overnight then follow the recipe where you left off, on Christmas Day. It tastes so festive – Like the essence of Christmas! If you decide to flame it, it will seriously wow your guests! No-one will ever guess this Christmas Pudding is vegan! If you aren’t familiar with traditional British Christmas Puddings, you might be wondering what you serve with them. My favourites are either brandy butter or vanilla ice cream! 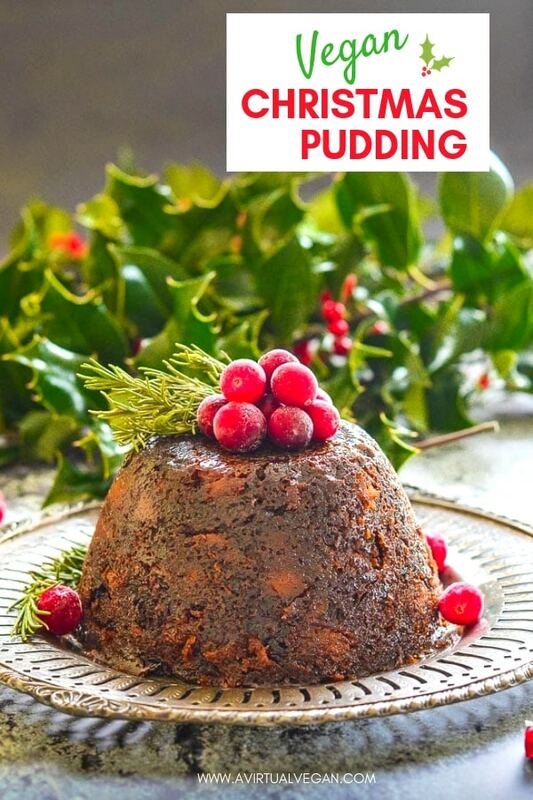 I know steamed puddings aren’t too popular here in North America, but I really hope you will make an exception and give this Vegan Christmas Pudding a try this Christmas! As with all of my baking recipes where precision is key to excellent results, I highly recommend using a kitchen scale to measure your ingredients, rather than using cup measurements. I love this one because it is very reasonably priced and it has a tare function which is really handy. It means you can place any bowl on the scale and reset to zero so it doesn’t include the weight in it’s calculation, plus you can reset to zero when adding multiple ingredients to the same bowl which saves on washing up! The Ultimate Vegan Christmas Pudding. It's dark, rich, fruity, moist & boozy & so much lighter than the dense, heavy puddings you might have tried in the past! 10 dried dates , I used Deglet Noor but Medjool or any other kind will be fine. You could even use dried figs if you wanted to. A 0.9 - 1 litre/2 pint/ 1 quart pudding basin , baking parchment, tin foil, some string and a pair of scissors. Put the dried fruit, including the dates and apricots, into a large mixing bowl and pour over the brandy (or alternative alcohol/juice). Leave until the liquid has been absorbed by the fruit. How long it takes varies depending on the fruit you use but it will be somewhere between about 15 and 30 minutes. While that is happening, place the pudding basin on some parchment paper and draw a circle around the bottom of the basin onto the paper. Cut it out and set aside. Then turn the basin over and draw another circle around the top of the basin. Cut that one out but cut a few millimeters inside the line this time so the circle will fit on top of the pudding batter when you put it in the basin. Set that circle aside too. Make sure your Instant Pot is ready with the trivet insert inside. If you are using a steamer have the water simmering ready under the steamer, and if you are using a large saucepan, have a heatproof upturned saucer or something similar in the bottom of a pan so the pudding doesn't come into direct contact with the heat when it goes in, and a full kettle boiled and ready. Grease the pudding basin with some coconut oil and place the small circle in the bottom of the basin. Once the liquid has been absorbed by the fruit, add the flour, breadcrumbs, baking powder, allspice and sugar to the bowl and stir really well to combine. Then add the orange zest, apple, aquafaba, blackstrap molasses and coconut oil and stir well until combined. Spoon the mixture into the pudding basin, smooth it out and top with the large circle of parchment paper, pressing it down all over and into the sides gently. Cut a large rectangle of silver foil and a slightly smaller rectangle of parchment paper. Enough to go over the top of the pudding basin with plenty to spare. Then lay the foil flat on your surface and the parchment paper flat on top of the foil. Make a pleat in them both as shown in my video above. If you need to see the technique more clearly have a look at this video (don't worry about buttering the parchment paper like he says. though). Cover the top of the pudding basin with the foil and paper making sure the pleat is in the middle, then press it down all around the basin as tightly as you can, then tie twice around the basin with string as tightly as you can. This is shown clearly in the video link too. If you are using a plastic pudding bowl with a lid, I still recommend covering the pudding with a circle of parchment paper, putting on the lid, then wrapping the whole thing in foil as I have had situations in the past where the lid blows off and the pudding is ruined by the moisture. Place the wrapped pudding inside the Instant Pot, resting on the metal trivet. Boil a kettle and pour hot water down the side until it is just under half way up the side of the bowl. It should not go above the foil level. Put the lid on the Instant Pot and make sure the vent is open. Set the Instant Pot to steam for 15 minutes. You will need to watch the clock for this part as the Instant Pot's timer won't count down for you. After 15 minutes, cover your hand with a dish cloth and seal the vent. Press cancel, then set the Instant Pot to Manual (or pressure cook in newer models), High Pressure for 60 minutes. Allow the pressure to release naturally. Make sure the water is simmering away well under the steamer insert . Place the pudding in the insert and cover with the lid. Cook for 3 hours. Place the pudding gently on an upturned saucer inside the pan and pour boiling water carefully down the sides so it reaches about halfway up the side of the pudding basin. It must not reach the foil. Bring to a simmer but don't let it rolling boil as you don't want the water to get up under the foil. Cook for 3 hours. When the time is up, carefully remove the pudding, then take off the foil and parchment paper. It should look cooked and a toothpick should come out clean when inserted. You can also just poke the middle with a finger and it should be firmish with a bit of bounce, like a cake is when cooked. In the unlikely event that it isn't cooked through you can return it to the Instant Pot/pan/steamer and cook it for a few minutes longer. Be sure to secure the paper and foil around it first though. Either serve immediately or leave to cool completely, with the paper and foil removed but still in the bowl. Once cool, wrap the bowl again in fresh paper and foil before storing somewhere dark and cool. On the day you want to eat the pudding you can either steam it again or you can microwave the whole thing or just individual slices of it. If you use the microwave make sure you remove all traces of foil. A slice takes about 40-50 seconds on full power, and the whole pudding about 4-5 minutes depending on how powerful your microwave is. Be careful not to overcook it so check it frequently. To reheat in an Instant Pot or other electric pressure cooker, put it covered as before (make sure it's all sealed well) into the pot on the trivet and pour in boiling water half way up the pudding bowl. Put the lid on, seal the vent, press steam and set the timer for 30 minutes. once it's done it will be ok on 'keep warm' for an hour or so if you aren't quite ready for it. If steaming it in a sauce pan or a steamer give it an hour to heat through. If you would prefer to make this pudding alcohol free you can replace the alcohol with apple juice or orange juice. Bear in mind though that the alcohol acts to preserve the pudding, so if you omit it, the pudding won't store well. You will need to keep it in the fridge and eat it within a week of making it. Leftover cut pudding will keep in the fridge for up to a week and can be reheated as mentioned in the direction. Whole untouched puddings, if kept wrapped, can be kept for up to 6 weeks somewhere cool and dark. (probably longer but I haven't tested for longer than 6 weeks). If you want to make it even boozier and moister, feed it one tablespoon of brandy once a week. Just open it up and spoon it on, then cover well again. Leftover or whole puddings, if wrapped well, will keep in the freezer for up to 1 year. 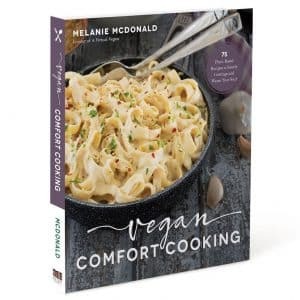 To see more classic Christmas recipes veganized, check out 50 Christmas Classic Made Vegan. It’s a recipe collection that I put together for Parade Magazine’s Community Table and is full of yummy festive treats! Thank you so very much for this recipe. I had the task of making 2018 Christmas dinner with all the foods my 6 children had grown up loving whilst accommodating not only my sons girlfriend who is vegetarian but also one of my daughters who is now eating vegan and gluten free and is allergic to cashews, pistachio and pine nuts. I didn’t want them to feel left out and I didn’t know how I’d go but I ended up with a table full of wonderfully tasting vegan foods, but The Star was your Christmas pudding. I followed the recipe exactly, using apple juice instead of alcohol, using one of my mums old pudding basins (older than me and I’m 50) which has a lid, wrapping the entire thing in foil as suggested, just for good measure, and using an old Bessemer steamer, sitting it in the insert section. I went with your cooking times, taking the steamer off the heat and leaving the pudding in it to cool (a trick I picked up as a kid watching my mum), it cooked perfectly. Both my family and myself were shocked at how amazing it tasted. The pudding was not only moist and light but effortless to make. With having to always cook for so many at Christmas, most of the cooking always having fallen on me, and my mum no longer around to cook the pudding, I admit I usually cheat and buy one. But, with this being the most delicious Christmas pudding I have had in my 50yrs and adding that it’s gluten free, nut free and vegan, the decision’s been made that this will be the recipe my family uses every Christmas from now on in. Thank you! I am thrilled you enjoyed it so much and touched that you will be cooking it every Christmas from now on. That makes me so happy. Thank you so much for stopping by to leave a review too. I really appreciate it! Thank you so much Wendy. I’m really pleased you think so! LOVE love love this pudding! Am a Brit who has eaten Christmas pudding every festive season of my life. This one NAILS IT! And is palm oil free. Really delicious, all the omnis in my life loved it too :-). That’s so good to hear Alison. Thank you! Happy new year to you! This is an amazing recipe. I loved it and my daughters, who both hated Christmas pudding enjoyed it too. I followed the recipe to the letter but would probably reduce the coconut oil, as when still warm , a light press on the pudding left it oozing. This however disappeared once cooled and in no way affected the taste. It was light and airy, and topped off nicely with your Vegan brandy butter, made out Christmas dinner complete. Thank you for a wonderful recipe. I made this for Xmas day and was blown away with how delicious it was. I made it gluten free using Bob’s Mill 1 to 1 baking flour and a local gf breadcrumb mix and it turned out perfectly. It needed an extra 15-20 minutes cooking time in the steamer and a little longer than 1hr to reheat but otherwise perfect. I’m also allergic to coconut oil so I decided to use Cacao Butter. Wow! I can’t compare it to anything but it wasn’t oily or greasy in any way and tasted amazing. I think next year I’ll back of a little on the fruit or sugar as it was just a little to sweet/rich. Hi there! I just wanted to say a bigTHANK YOU for this recipe! My family and I went whole-food plant-based oil-free a few years ago and my husband always wished we could have christmas pudding. But usually of course it’s full of alcohol and butter or at least heaps of oil. I made your recipe with fresh orange juice and just out the oil – I added a bit more juice and a larger apple and it turned out so AMAZINGLY DELICIOUS. He is blown away and we will now make this every Christmas. 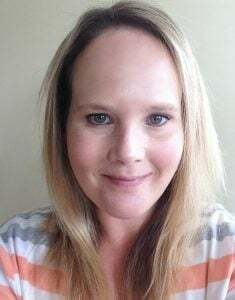 The whole instructions were greatly detailed and perfect – I love my instant pot and having the recipe written for it was fantastic. Thank you for giving us back a beautiful (but formerly unhealthy) Christmas tradition! And for anyone like us YOU CAN MAKE THIS OIL FREE!!! Wow Anna that’s so good to know it works ok oil-free. I’m so glad you were able to adapt it to suit your needs. The Instant Pot makes cooking this so trouble free eh? Merry Christmas! Hi! This recipe looks amazing! Do you have any advice on how to make the custard? :) thanks! I haven’t actually tried making vegan custard from scratch yet. When I make it I tend to buy Bird’s Custard Powder which is accidentally vegan and make it up with a nice creamy non-dairy milk. It’s a British product but some shops here in Canada sell it and Amazon do too. Maybe you can find it? I do intend on making a vegan custard recipe at some point though so watch this space! Hi. I am in the process of cooking the Xmas pud, after 3 hours I checked it ( it’s in a pan on an upturned saucer) and it was still very wet and didn’t have any bounce. I’ve left it another hour and it seems the same?? Help? Does it normally look pale and a bit wet? Is it because I didn’t have enough water in the pan, it was about 1/4 to half way up the pudding bowl? I’m not sure what to do now? It definitely shouldn’t look pale. It should be the same colour as mine in the pictures. A nice, rich brown colour. The black strap molasses is so black that it makes it dark, and the dark brown sugar too so it shouldn’t be pale looking, even before it’s cooked. You didn’t sub any of the ingredients did you? It also shouldn’t be wet. It will have some condensation in there and be a little damp to touch but not wet. Are you sure it was really tightly sealed so no water could seep in? The water should have been about half way up. If it was a little less it shouldn’t affect it too much. After 3 hours though it should be cooked. Have you done the toothpick test. It should come out almost clean? If it does it’s done. If it doesn’t cook it a little longer. Do you know if I could work this recipe into a pressure cooker? I have an 8L pressure cooker that is big enough for this I think. How long would you think I should cook it for? I should probably cook it on a low heat as well ? You can for sure. I give instructions for an Instant Pot which is an electric pressure cooker, but I have never used a stove top pressure cooker so I am not totally sure on cook times in one. However, I found this website which gives conversions for Instant Pot and stove top pressure cookers https://www.hippressurecooking.com/pressure-cooking-times/. They have just about everything mentioned except puddings, but it looks like the times for everything are pretty comparable. There are only a few minutes difference. I use the high setting on my Instant Pot but how that compares to a stove top I don’t know. I would imagine it’s not as hot so I think low would probably be the best bet. I think I’d cook it for about the same time then stick a toothpick/skewer into it and check it comes out near enough clean, then put it back on for a bit if it needs it. It will be a little trial and error but should turn out fine. Or can you just steam in your pressure cooker? If so you could do that for 3 hours instead of actually pressure cooking it. I hope that helps and good luck! Just made this. It turned out beautifully. We can’t wait to eat it on Christmas day with your brandy butter! Hi Mel. This recipe looks great. I noticed that the link to your pudding basin shows a 2.75 quart basin, but you mention that we should be using a 0.9-1 litre sized basin. Does it matter if I use a larger basin? Or do you recommend the 1 litre size? Sorry Martha, that link wasn’t working properly. I just tried to fix it but Amazon keeps insisting on sending me to the 2.75 quart basin. They obviously wants us to make a bigger Christmas pudding! I’ve changed it now so it just takes you to a selection of 1 litre basins. It should be a basin of around 1 litre. That will ensure it’s filled and you get a nice pudding shape. If you use a bigger bowl you will end up with it being half empty and get a really shallow pudding. If you only have a bigger bowl, you could double the recipe and steam it for 5 hours instead of 3. In an Instant Pot you probably wouldn’t need to increase the cooking time. It will just take longer to come to pressure and longer for the natural pressure release after. Hope that helps! Hi Mel. I made the pudding and your vegan brandy sauce and they were a huge hit! They tasted exactly like the non-vegan versions. I ordered a basin that was 0.9 litres and the batter fit like it was tailor-made. Thank you for these fantastic recipes. I’m so pleased you enjoyed them Martha. Happy new year to you! Hi Mel! I’m just getting ready for my Christmas cooking now. I found your recipe back in January and have been waiting to try it, and now’s the time! If I were to double the recipe, do you think increase the cooking time (for steaming) up to 5 and a half hours? Thanks, Jacquie. I have never doubled this recipe so can’t say for sure. Sometimes when you double a recipe it doesn’t take double the time to cook. I think I would check it at 4.5 hours just to be safe, although steaming is pretty forgiving so if you left it 5.5 I think it would probably be ok. If you aren’t using a bowl with a lid and are just wrapping it in parchment paper and silver foil, you can actually stick a skewer or long thing knife right through the top to see if it comes out clean, then just wrap more foil over it tightly to patch it up before putting it back in if it needs more time, or before storing. I hope that helps and that you enjoy it. I need to get a move on and make mine! Thanks for the recipe.We made it this Christmas and it was quite simply the best pudding we’ve had (and we’ve been making xmas puddings for 25 years so there was a lot to compare it with). Easy to make with great flavour and texture this will be a family staple from now on.The only change we made was to use less oil (15g) and it still worked.Many many thanks. Thank you so much Bob. That’s made my day! Best in 25 years is some compliment. Thank you for stopping by to leave your feedback. It’s much appreciated! This was delicious, everyone who tasted it loved it. Excellent with your brandy butter recipe Thank you ???? So if I reheat the pudding I steam it for one hour in the insta pot? I just noticed that I didn’t add the reheating instructions for the Instant Pot. When I originally said 1 hour I actually meant if doing it in a saucepan or a steamer. I have updated now but to save you going back, put it in the Instant Pot as before, fill half way up the side of the bowl with boiling water, put the lid on, seal the vent, set to steam and set the timer for 30 minutes. Once done it will be ok on keep warm for about an hour if you aren’t quite ready for it. Thank you for asking for clarification. If you hadn’t I might not have noticed! This Christmas pudding really hits home for me, funny enough I wasn´t a fan either as a child, but now it´s a favorite. Hi there thanks for this recipe. I’m plant based over a year but wouldn’t say vegan as I use wool to knit. Anyway, I was wondering whether you can taste the coconut oil? I’m not a fan when it overpowers a dish except in Thai green curry where it’s yum! Also I make my pudding with cider too it’s so light. Thanks in advance. Happy Christmas! If you aren’t a fan of the coconutty taste of coconut oil in your cooking, you can buy refined coconut oil. It has no coconut taste or smell at all and is usually easier to get hold of than unrefined or virgin coconut oil. Having said that, even if you do use unrefined coconut oil in this, the flavour doesn’t come through at all. There are a lots of strong flavours with all the fruit, molasses and alcohol. I certainly can’t detect any coconut in it at all when I eat it. Hope that helps and Merry Christmas to you too! Wow…I have never had Christmas pudding of any kind. This sure sounds good, though. I used to love fruitcake back when I could have it. If I make this, it will be gluten-free, and I’ll report back. If you love fruit cake you will love Christmas Pudding as it has all the same kind of flavours! When I made this this morning, I used rum instead of brandy, and in addition to the dates and apricots I used figs, blueberries, cranberries, cherries, and raisins. I used Arrowhead Mills’ gluten-free flour and Katz GF breadcrumbs.` Everything else was according to your recipe. It’s very tasty, although it’s softer than a cake. I wonder if more breadcrumbs and/or fluffier breadcrumbs would have made it drier. Or is it not supposed to be cakey? The individual fruits were still somewhat identifiable, although I chopped the dates, figs, and apricots so they would be closer in size to the dried fruits. That’s how this is supposed to be, right? As an American, I just don’t have much reference for this. Personally, I could see using way more orange zest, like the zest of two or three oranges, although that may just be my memories of citrus-heavy fruitcakes talking. My guests and I certainly enjoyed the pudding with coffee, and I feel like I may have added an old tradition to my personal traditions. I sloshed some more rum (hic!) over the leftovers and am looking forward to savoring them over the coming days. Thank you so much for sharing this! Hi Chessie. Christmas Pudding is not like Christmas cake. It has the same kind of rich flavours but the texture is very different. It is supposed to be softer and a lot moister. It doesn’t have the crumb that cakes have so isn’t cakey. It also isn’t traditionally really citrusy although adding more zest wouldn’t affect the recipe at all so you could add as much as you want for taste. I have only tested the recipe with regular all purpose flour and oat flour so can’t say for sure how the Arrowhead Mill’s GF flour affected it but it sounds like it was how it should be. I love that you added a healthy dose of rum and am so glad you all enjoyed it!